The 2018 Parade of Lights is scheduled for Saturday, December 1st, 2018., at 7:00 p.m., and your participation can go a long way toward making this remarkable evening just that. 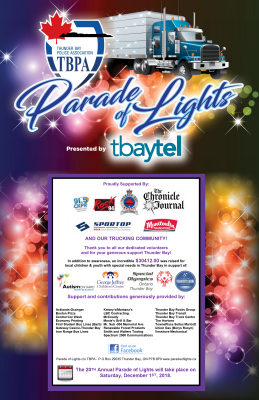 This event can only take place with the continued support of the Thunder Bay Trucking Community, through companies and people like you. $30 412.00 last year because of the Parade of Lights. 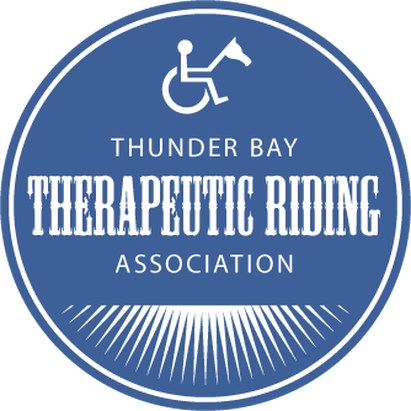 Autism Ontario - Thunder Bay & District Chapter, George Jeffrey Children’s Centre, Special Olympics - Thunder Bay & Thunder Bay Therapeutic Riding Association children, youth, and young adults benefit from both the donations and the increased awareness the Parade of Lights brings to their causes. This year participate in our online 20-20-20. 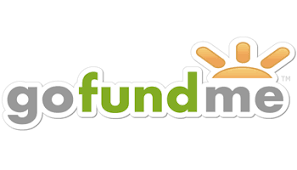 In addition to our typical fundraising we are asking for your support to donate $20 for our 20th Anniversary to raise $20 000 on Go Fund Me. This will help us meet or exceed our 2018 fundraising goal of $40 000. We are also excited to be offering a sensory friendly area. See Parade Route map for location. For everyone's SAFETY we request that ALL Parade of Lights watchers, parents, guardians, & children keep OFF the road while watching the parade. Also please do NOT leave or exit the Parade of Lights until the school bus followed by a police car has past your location. This is your sign that it is safe to leave. The purpose of this is to ensure the safety of the volunteers who are collecting donations as they are being picked up.